The General Tommy Franks Leadership Institute and Museum appreciates each and every contribution, regardless of the amount. Your support makes it possible for the Museum to continue in its mission to advance the understanding of historical events, encourage leadership development and inspire enlightened decision making by providing a forum for critical thinking through scholarly research, exhibitions, and public programs. Please consider enlisting in a Tour of Duty, our challenge to invest in the development of future leaders through Museum programming, education and outreach. Shopping online? 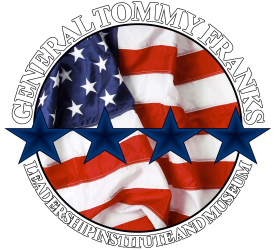 When you use the General Tommy Franks Leadership Institute and Museum Amazon Smile link, Amazon will donate a percentage of your purchase back to the Museum! Now you can shop for your favorite things AND support a cause you care about! ​Help the museum by shopping through smile.amazon.com/ch/20-5260489 and Amazon donates to General Tommy Franks Leadership Institute & Museum.